The following Matt cartoon from The Daily Telegraph made me smile…following the announcement of the birth of a baby daughter to Zara & Mike Tindall, 17/1/2014! Well you may wander where I have been – I have not added an entry for a while! I have the perfect excuse and one which I do not have to give apologies for really! I have been so busy with my midwifery practice, supporting women/couples in a whole variety of different ways, all bespoke to their own individual needs and wishes. And since I am so passionate about midwifery, I have been busy enjoying my professional role! 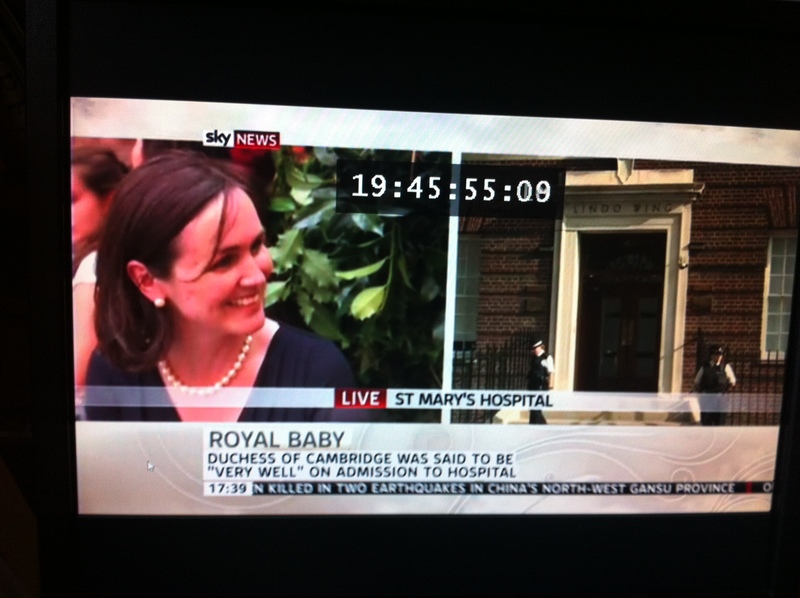 Many congratulations go to the new Royal Baby born in July 2013. 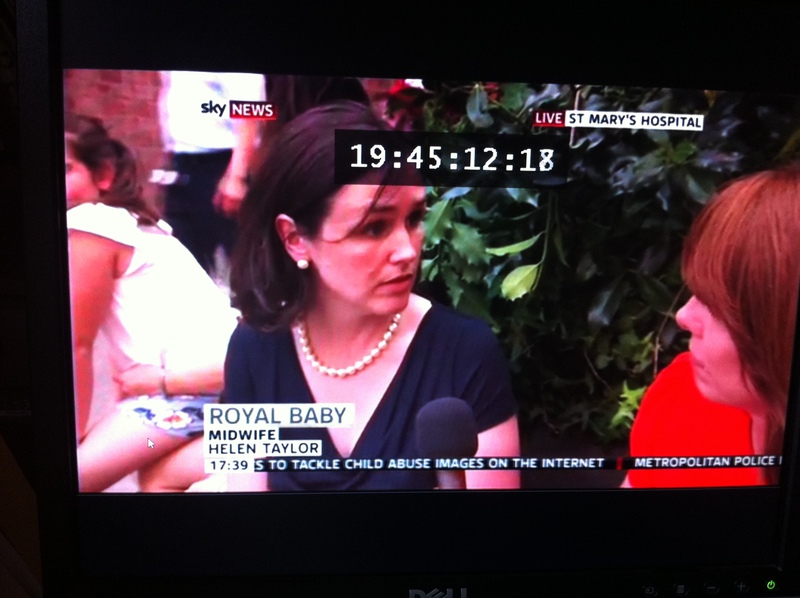 I had a new role for myself that day, employed by Sky News to give an interview, outside the Lindo Wing where the Duchess delivered her newborn son. The photo’s of me are not the best quality so do forgive, but illlustrate the point! I read this news item on BBC website, and it was one of those moments in life when you think “my oh my”. You can understand the reasons why “foreign made formula” has become in such demand in China, given the details described of milk powder being laced with chemicals, and the awful consequence’s for babies health and well being………..this news item has got to be another good reason to add to the already full list of good reasons to at least try to breastfeed your baby! Please note the “to at least try to breastfeed”….as an experienced midwife and mother myself of 3 children, I am only too aware that for some women, despite all their best efforts,breastfeeding is so much more difficult to achieve than for others. Key to breastfeeding is early support and encouragement in the first week, getting off to the best start possible for mother and baby. I am always happy to help and advise!! “Retailers in the UK are rationing sales of powdered baby milk because of a surge in demand in China. Danone, the manufacturer of Aptamil and Cow and Gate baby milk powder, said most supermarkets were introducing a restriction of two cans per customer. It said the limit was to prevent some individuals from bulk-buying baby milk for “unofficial exports”. “We would like to apologise to parents for any inconvenience caused by this limit. We know that most parents only buy one pack at a time, so we hope that the impact of this limit on UK parents will be minimal,” it added. Foreign-made baby formula are popular in China, especially since a locally manufactured formula laced with the industrial chemical melamine killed six infants in 2008 and caused another 300,000 to fall ill. Earlier this year, shops in Australia were forced to restrict sales of infant formula, as Chinese customers and tourists bought them in bulk to send them home or to sell them online. Keep as active as possible as you approach your due date! So following on from optimal fetal positioning…………..
As you approach your due date, this can be a time when you are most challenged by the pregnancy. This is not only in respect to being physically challenged, but also mentally/emotionally too. So on a physical level, getting about can be difficult, not only due to carrying the weight of pregnancy, but also as the baby’s head starts to enter your pelvis or “engage”. The strain on your pelvic floor is enormous, and all your pelvic floor muscles are working so hard to keep everything in! Secondly, emotionally, it is getting closer and closer to delivery, and the uncertainty of “when” and “how” for labour can really play with emotions. Many women go on maternity leave, some weeks before the due date, others literally as their due date approaches. If you enjoy work, then this can feel like a “loss”; for others it may be a huge relief to be finishing work. Either way, big changes in your daily routine! When you give up work, do try and stay as active as you can. The temptation may be to feel that the least physical exertion you have to spend, the better! However it is best to keep yourself as up and about as you can. One really helpful and yet simple tip is to find the time each day to have a walk, for at least 30 minutes. It is so useful for all the optimal fetal positioning points that I have mentioned in the two previous blog entries. Apart from, the benefits of getting out and about in the fresh air! If you think you are in labour, going for a walk can help in encouraging things to get going. 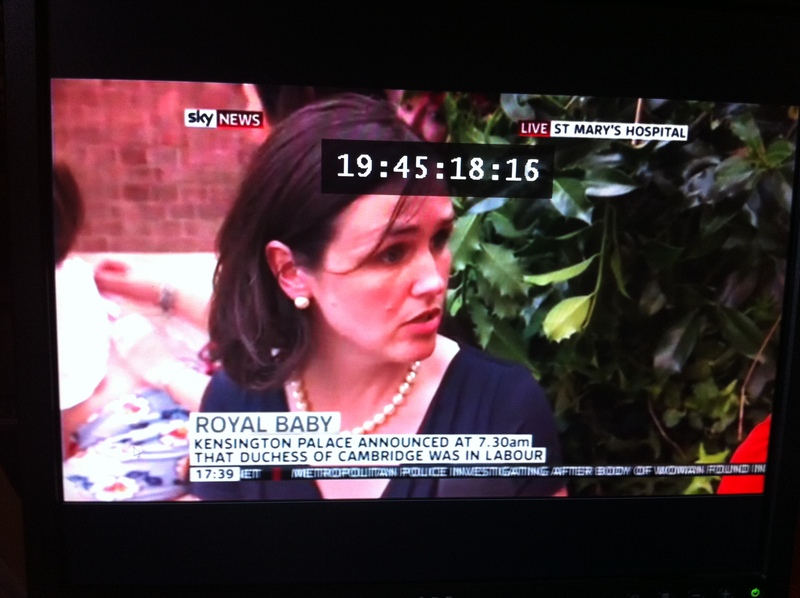 You can never “will” yourself into labour but it can help to stimulate contractions in the early stages. I remember walking around our local park at 22.30 hours with my husband and trusty dog when I went into early labour with my first child. Before going for the walk, I was not really sure if this was my body having yet another practice session or potentially was it labour? By the end of the walk we were sure that this was “it” and sure enough it was the start! The walk definitely helped to encourage more consistent contractions. Keep safe though! I don’t promote walking around your local park alone, query in labour, in the middle of the night!! Neither in horrid weather! Common sense prevails. Optimal fetal positioning – practical solutions! Ok so following on from my last post…as promised, practical ways to encourage your baby to line up well with maternal pelvis, in readiness for labour! Pay attention to how you relax on the sofa….try not to slouch too much, which can encourage baby to lie OP. Use cushions behind your back to support you in an upright sitting position, with maybe a footstool to raise your feet up off the ground a little. Aim for your knees to be level with your hips. A large book or sturdy shoe box is high enough to act as a footstool. Birth Balls/ exercise or pilates balls are absolutely great for getting your baby in a good position. 1/2 hour a day sat on ball is ideal. To get your balance, you sit well with a straight back, and knees apart. A small bounce motion can help nudge your baby into a great position. Goes to say it is also good in labour to sit on too! Avoid crossing your legs as this reduces the space at the front of your pelvis….to be honest it is pretty tricky to do in the third trimester of pregnancy anyway! Try sitting the other way around on a dining chair – really opens up your pelvis. Sleeping on your side, not your back. All of the above are helpful and ideally you would commence the above from 28 weeks onwards, to encourage your baby to lie in an optimal positioning in utero. Remember you cannot force your baby to lie in a position! Gentle encouragement! On a positive note….my client I mentioned last week ….she had done the exercises above and baby was lined up in LOA position. Labour progressed well for her, as baby was in the ideal position, and she had as “smooth” a labour as you could hope for! This topic is a real passion of mine as a midwife, and all my clients get to hear about it! Well, we know that there is an “optimal” way for baby to line itself up for the most efficient way of manoeuvring through maternal pelvis. And that is all to do with the widest diameter of the babies head lining up with the widest diameter of the maternal pelvis. The ideal way for the baby to enter the pelvis is when the baby is lying on maternal left side. This position is called LOA which stands for Left Occiput Anterior. To explain the jargon, the occiput is the back part of the baby’s head. So the baby’s back and therefore occiput is on the maternal left, as demonstrated in the photo of my model doll and pelvis. Just to add though, the baby needs to have its chin on its chest, (we call this a flexed chin) to get through the pelvis and my doll refused to flex its chin onto its chest!! Photo does though illustrate well position of back in maternal tummy! Second most common ideal line up for the baby is ROA i.e when the baby lines up on the maternal right. Both the above positions encourage the baby to tuck their chin onto their chest which then helps as they enter the pelvis at the end of pregnancy or “term” or pregnancy, as well as in labour itself. The not so favourable position is when a baby lies in an OP or occiput posterior position. i.e the baby is lying with its back up against maternal back, looking to the front of maternal tummy. In this position the baby will not be able to enter the pelvis so easily and most will eventually rotate to a more favourable position as described above. The knock on effect of this is that “OP” labours are often more longer (as the baby has to turn or rotate into the OA position) and so can be more tiring, and often this leads to the need for more pain relief in labour. Additionally OP babies often do not descend into the pelvis or “engage” before labour starts. This means that you are more likely to go over your due date . I have to dash as I have a client to attend who is in labour. When I palapated her abdomen at her last appointment her baby was in the LOA position so she is hoping for a smooth labour! Next blog post I will write about how to get your baby to line up in the good or optimal positions we have discussed ready for labour!